Droyers Point is a private and gated waterfront community offering the convenient lifestyle of condominium ownership and all its advantages. Outdoor chores like lawn mowing, snow removal and exterior maintenance are eliminated. Droyers Point residents enjoy the comfort, privacy and investment advantages of home ownership without the responsibilities of property maintenance. Floor Plans: Droyers Point consists of 380 Townhouses with four different floor plans. They all have either a one or two car garage. Click Here to see the different floor plans or click on the "For Sale" tab to see what is currently available for sale. You'll find spacious homes with an abundance of living and storage space. Security: Droyers Point is a gated community with 24-hour security. The gatehouse with manned security will give you the comfort of knowing that this is your own private world where only you, your neighbors and invited guests are welcome. Promenade: Stroll on Jersey City's most beautiful promenade. The romantic, tree-lined promenade that surrounds Droyers Point is one of those special places you want friends and visitors to see. Hugging the water's edge, the promenade is graced with light posts that will light your evening strolls. Here, you can sit by the water and contemplate your next activity, or relax and watch the evening go by. Inground Pool, Fitness Center, Clubhouse & Tot Lot: Few pools have more beautiful settings than those at Droyers Point. You'll feel like a guest at your own community center. It's there for residents to use as they see fit. There's a fitness center, cozy fireplace, a large room to read, watch TV or just relax in. A great place to make new friends. 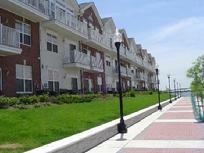 Location: Droyers Point is conveniently located off of Route 440 in Jersey City. No matter where you work--in Jersey City, Manhattan, the suburbs or hundreds of other places, Droyers Point offers easy access to the business and industrial world. Roadways and public transportation are plentiful and superb making it an easy task to get to work. Click Here for directions. -The A & C Bus Corp runs between Society Hill and Journal Square. -The New Jersey Turnpike is approximately 5.1 miles from Droyers Point. -The Holland Tunnel is approximately 6.3 miles from Droyers Point Click Here to view Map and Directions. -The Lincoln Tunnel is also easily accessible. Click Here for Map and Directions.